I use my HQ solar grill because it is cheap and sturdy, and it cooks all kinds of foods. I haven't tried yours but it looks very similar to mine so I'm guessing it works great! 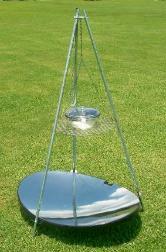 Your parabolic solar grill looks very nice, similar to the Solar Sizzler from Canada. From the photo it looks very well built and sturdy. I hope you might share your name and location with us and also what you have been able to do with your solar cooker.